…that William Sewell Jr., a Yale Medical School student, built the first “artificial heart” out of Erector Set pieces (including the motor and metal beams), readily available laboratory supplies, and a valve from a toy noise maker. 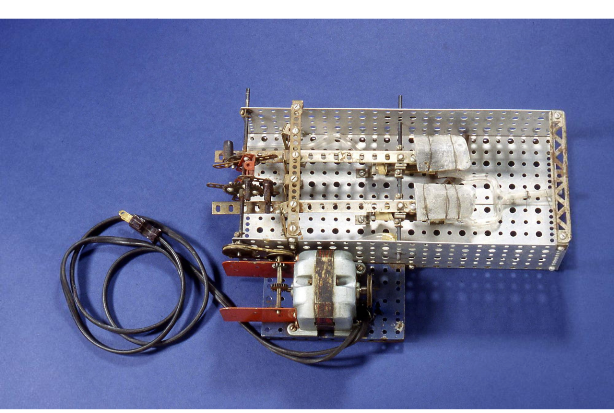 Sewell wanted to build a tool for cardiac surgeons to use in laboratory experiments. His concept was the design of a pneumatically powered pump to be used as an artificial heart. Advised by Dr. William Glenn, Sewell successfully bypassed the right side of a dog’s heart, proving that a mechanical pump and compressed air could circulate blood for a prolonged period of time. In 1949, the first experiments resulted in a total bypass of 61 and then 82 minutes and the recovery of the dog. Sewell’s heart pump led to later advancements in the field of cardiac surgery and to the development of a total artificial heart. “Sewell Heart Pump.” National Museum of American History, 2015. Link. “Sewell’s Pump.” The Eli Whitney Museum and Workshop, 2015. Link. Mohawk Mountain Made Snow for Winter Sports Lovers – Who Knew?